My latest interview had taken me to the northeastern state of Pennsylvania, home of the Liberty Bell, Hershey’s chocolate, and ex-volunteer Christina. I recognized the house from google maps: four bedrooms, detached, with an oversized truck parked in the driveway… the same as every other house in the city. I removed my leather gloves and knocked loudly on the glass door, wiping my slimy shoes on the mat. Once inside, I saw that the room was spacious, yet cluttered with art supplies and stuffed toys. There were pictures of little people on the mantelpiece, or ‘children’ as they were sometimes called. This was a family home – full of memories, love and warmth. I plumped up a cushion and took a seat in the comfy armchair, ready to begin the interview. So, Christina, let’s start with some private questions. Here is a tricky question, how old are you? You should not ask a lady her age. This is a question everyone wishes to know though. Despite ignorance.. I am not 50 nor 30. Hell, my Mama is in her 50’s. I don’t lie about my age either…I just do not say. For how long have you been on xat? Since May 2007. Before that in a webkinz site. We used xat for our chat box. It was from there I discovered that a whole universe of chat boxes existed. 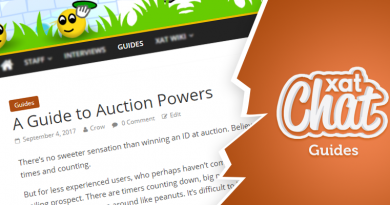 This site was also the inspiration used for the trading system of powers. I took Chris (42) there and showed him the online virtual trading world in 2008. I loved it, the fact that you could customize your own chatting experience, meet new people, learn new kinds of things. xat has! I have learned online safety and a lot about computers and setting up sites. I am not sure if I would have been able to do my In real life job without xat. It has a lot of similarities. I work online for a non charitable legal organization. What I have learned via xat has helped me integrate to that. I have met Jamesey, also known as Cyan, and Gary. Time to speak about your preferences on xat. I have many favorite powers. I love NOPC and single because of the functions. I suggested a lot of powers and I was inspiration for many, through the years. Hexagon was made pink for me. Pink pawn was made because of me. I also took part in the inspiration of Costumes, Fairy and Single. Trade will always hold that special place in my heart. Although it is hard for me to be on it. My favorite chat at the moment is Deal. My family and friends are there. I can continue to do what I loved and developed on Trade but on an international level. Deal is not Deals and Gary has no involvement, just to clarify. I have so many. If I had to choose one I would probably say the day 42 gave me main on Trade along with Christina ID. I also gave him a chat I made. This would have been in 2009. Let’s get into it and talk about what you did for xat. What did you bring to xat? I inspired the Cam feature and the Live mode. I was a big part of why there is account locking and authentication. So much of me will forever remain. How would you describe your career on xat? For me xat has had many joys and many sorrows. My user experience has been blessed, overall. I was made mod on Help in 2008 by Chris. It was short lived and controversial. Back then I was so so stupid. Gizzy and I shared accounts, that’s a funny story actually. I chose Gizzy over rank. These events are probably what earned me respect by Chris though. I had the pleasure of being “friends” with Admins, especially Chris, when they were always on chat and more user friendly. I have had the pleasure of receiving gifts from them, giving them gifts, and having powers made for me, including cyan pawn and power 42, which Chris himself, worked on. I got the privilege of owning Trade for 8 years and the privilege of owning officials, of helping to develop volunteers, and to push for things I believe in. One thing I always disagreed with volunteers over, is that I am FOR the users. I would often help people on chat rather than on the ticket system. I think this benefited me. Volunteers can NOT understand how I continue to have so much user support, especially when I made Tr4de. So many users followed me and it shocked the volunteers for sure. It is because I am of the people and for the people, and the people like that and respect that, sadly Chris did not see this. There was always 2 sides of me. Volunteer Christina and the personal one. I always treated everyone with respect, including labeled bad users. I never let the label of volunteer precede me. Even now, I continue to help users each day. Sometimes I feel this angers certain volunteers. They would have LOVED to bring me down. However… I remain ME and will continue doing so. Jealousy is a sad thing. Hatred must mean you have done something right. I would rather be hated than loved if it continues to get the users what they want and need. Every day a handful tell me that xat lost a great one in losing me. For me..this is what made it all worth it. If I have touched one life, I have touched many. I am no longer “trusted” by Chris… I shared a screen of their email to me. I do not regret doing this because after 8 years of service, having people continually attacking me, being a target, having people hating me because of who I was, fighting to make the site better, fighting for the users rights, ALL for him…everything I did was for him… He had the audacity to say I could not be trusted for who I date. This probably hurts me more than anything on xat. I didn’t mind losing Trade. I didn’t mind losing volunteer. I didn’t mind being continually criticized. THIS WAS what hurt me! I thought he would be able to separate professional emotions and personal emotions like I did with my friends. This is what hurts also, if he respected me enough he would of given me the REAL truth. Not a very good one, I am afraid. I feel that for most part xat has lost its good volunteers. I have hope in a few like Brandon and Elie though. They are good souls and people like that help xat grow. Tickets are taking longer to answer and users grow impatient. Why is this an issue now? There are less tickets than 2 years ago due to less users. It’s a “Who is capable” situation. I feel xat lacks exploiters, having labeled most bad users or gits. I feel most people are “help junkies” with general knowledge. Test powers are being sold instead of tested. Volunteers or contributors are being made based on who you know. Users are leaving from boredom or unfairness. Powers are broken and rarely being fixed. Admins are working HARD on mobile in hopes it will save xat. I fear it may be to late. Their focus should be on clientele, and keeping the users happy more. I will not sugar coat things. I know me stating what I feel to be the truth will create animosity toward me. I came in a era where we worked to impress Admins. We aimed to please. Most have given up hope and left. Despite what some feel. I do wish xat the very best. I hope that they can turn it all around or see the truth clearly before it is to late and xat has a doomed future. I continue to have love for the site…just not for the political side of it. Perhaps one day, if they fix all that is broken within it, and I am not talking about broken powers and chats either, he needs to repair the trust issues he has, because who he trusts does not have the best intentions. Funny… I guess I no longer have one. It was definitely Chris. But that is past. What was your worst event on xat? It was probably being judged based on who I dated versus what I did and continue to do to help the xat community. I can’t necessarily say I regret anything on xat. If I should have been judged for this, it should of been 2 years ago when Gary was owner on Trade. I could not clearly see what was happening in that time period due too so much controversy, drama, trolling, and a war between staff, users, and him. We also were dealing with something personal in real life. I was wrong in a lot of how I handled the situation. I tried to make it right but people do not forgive. Yet, that is fine. I gave him deal, a dead chat no one used. It was my way of making him feel important while bringing peace back to trade and its users. I tried hard to separate the two. I separated myself from deal and focused on Trade. Each time someone complained about deal though, it started a war with volunteers and me. It was as if everyone held the actions of a non official chat against me. Everyone judged me based on who I dated and felt I should control him. Not everyone is controllable. Its also funny to see that the users complaining about it were staff there and helped to participate in the unfairness. I wanted to be judged based on my actions and what I continually did and still do for the xat community alone. For this reason, I did not tell xat, volunteers, or even Admins (Chris), that Gary and I parted ways during Christmas. I have not been to see him since. This was before I lost trade or title of volunteer. I felt people would just use it against me to say I was using it as an excuse to keep trade. It was really no ones business but our own. 3 years of loving someone came to an end. Did losing your positions change your chatting experience on xat? I trust less. You see people’s true intentions, people who stood beside me in trade, pretending to support me, while talking behind my back. Staff and friends who claimed they loved me while secretly camming my boyfriend. Volunteers who try to get information out of you just to use it against you. Friends who choose rank over friendship or hide it in fear of losing privileges like wiki or contributor. xat is a funny world. We come from all walks of life. We all have issues. We are all brought together by a chatting experience. I value who I am. I value my Morales. I value I am the same person on or off the computer. I value my honesty and my integrity. For me, none of this changes. I love to help people and I love to make xat a safer better place. I am just me. Like me or not, I will not change nor go away for anyone. What do you think of your successor, Maverick? Maverick and I use to be good friends. I was the one who always supported him. Since he now owns trade though, he seems to hold animosity toward me. I hear a lot of stories and many users come to me to complain. Although I can appreciate what he tries to do with the chat, I feel he fails to address a lot. He was never part of the trade team and is not experienced. I feel he trusts a lot of old staff and fails to see some of the drama they create with the users. I wish for him nothing but the best and as he gets more experienced, I am sure he will do great. Trust is hard and a funny thing. There are different levels of it. Chris always told me I was too trusting and to trust no one. Funny how that works. I have learned that you can’t trust people that you THINK you can. There are always ulterior motives. I trust TinkerDoodle the most. He has always been there for me, and continues to support me and help me each day. He was the one who stuck around when things started to get hard, and sadly there aren’t a lot of people like that on xat anymore. I trust Karl and Mike to large degree. What are you planning to do with Deal, do you want it to be an official? I am hoping to make Deal great. A lot of chats are dying, less users are on. This will be a challenge. But Adam and I had a dream. I was too busy to focus on that prior. Deal was Admin made. I can’t say that I want anything from it. It’s not if a chat is official or not, that matters. Great Leaders are born and not made. But I’m glad I’m not alone in deal! I have Tink to pick up on some of the stuff I lack! I look forward to deals future! If you had something public to ask to admins, what would it be? This would actually be a waste of time. I know them well enough to know they would never answer something publicly. I am not sure there is anything I would want. I guess in the end, I would ask if they really felt I could not be trusted, The REAL reason behind it all. 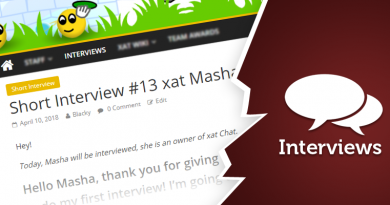 Do you have an interesting fact to tell on xat? A few months ago trade pools were changing names. (rats etc) It was me doing it. If I wanted to hurt xat, I had my chance. I still had forgotten ranks until I, myself told Chris. I could of done some damage to trade or xat. I chose not to. I chose to be the better person and be true to myself. EVERYONE has a touch of good and a touch of evil. It just depends on how you choose to let it control you. I finally feel at peace. I will continue to help the users and continue to be me. Chris once said I do not have it in me to hate. He is wrong. I do hate. I thank them showing me the way. But unlike them, I will be proactive with hate. I will make the hate makes me stronger, not weaker.